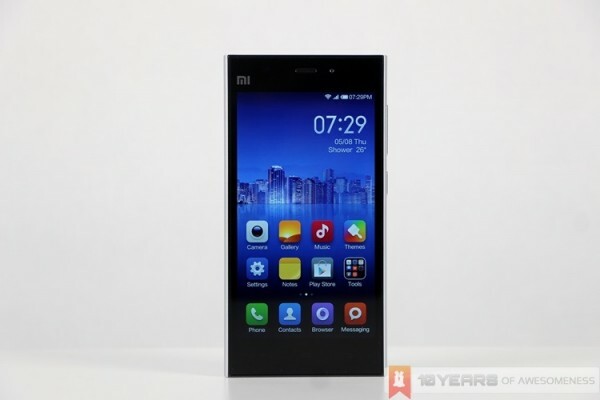 Without a doubt, the Xiaomi Mi 3 is one of the most exciting devices to be released in the country. Featuring flagship-level specs at almost a third of what you’d expect to pay for a flagship smartphone, the device is also one of the most elusive, available (officially) only via Xiaomi’s flash sales at an eye-wateringly affordable price of RM769. But what if you are one of the many, many frustrated people who can’t get their hands on the Mi 3 via the flash sales? Your only hope lies with the local telcos, specifically the big three: DiGi, Maxis and Celcom. 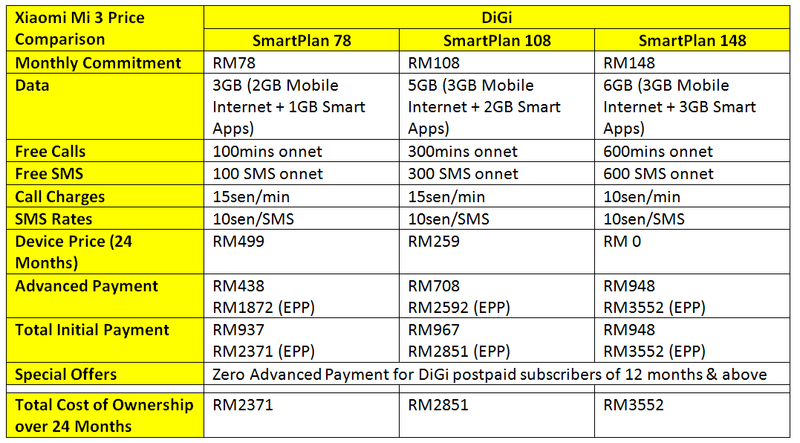 Of the three, DiGi is the only one offering the Mi 3 both with an off-contract prepaid plan as well as a postpaid plan – though that offer has since ended. On the other hand, the postpaid bundles offered by all three telcos give steep discounts on the device price, so if you’re interested, read on. The Xiaomi Mi 3 is only available on contract with DiGi, Maxis and Celcom (sorry, U Mobile users). Each of these postpaid plans only offer the Mi 3 with a 24-month contract, with no option of a shorter contract – and that’s really odd considering the price of the device. Then again, with this being such a sought-after device, it could be that our local telcos are taking advantage of the situation. 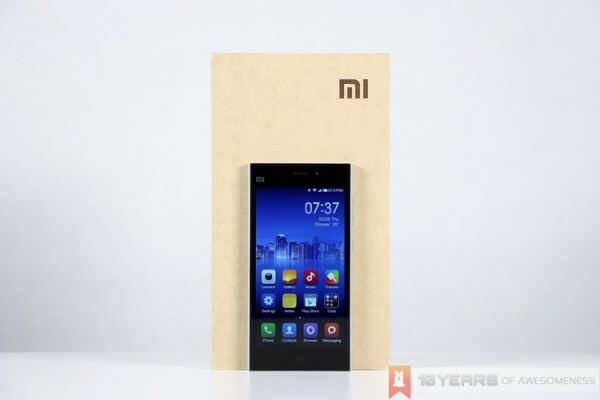 DiGi offers the Xiaomi Mi 3 with three of its DG SmartPlans, but from the table above it is fairly obvious that the rebated device price is not as high, considering the length of the contract. Inclusive of the new RM110 rebate that DiGi introduced after Xiaomi dropped the retail price of the Mi 3 from RM889 to RM769, the SmartPlan 78 only saves you RM380 off the Mi 3’s RRP. The SmartPlan 108, on the other hand, seems like a pretty balanced choice. In addition, one of the sticking points with DG’s SmartPlans remains: the segregation of the allocated data quota. At first glance, the DG SmartPlan offers generous amounts of data, but a closer look will reveal that up to half of the allocated monthly data is reserved for what DiGi calls Smart Apps: Facebook, Twitter, WhatsApp and WeChat. We’re pretty sure these apps don’t use that much data, which makes this quota segregation really odd. The Xiaomi Mi 3 is offered as part of Maxis’ new MaxisONE plan. This much-maligned plan offers limited amount of data at 2GB, but its key feature is its promise of nearly unlimited calls and texts to any number in the country. Just like DiGi, Maxis has also further reduced the device price of the Mi 3 by another RM120 in line with the recent price drop from Xiaomi. The last of the big three to release their Mi 3 bundle, Celcom is also arguably offering the best postpaid bundle. The Celcom First Prime + mPro offers a generous 5GB of data and RM40 worth of calls and SMS – but with a monthly commitment of RM128, you’ll get the Mi 3 for free. If you don’t make that many calls and SMS, you can also opt for the mPro Plus plan, which is almost a pure data-only postpaid plan – but you’ll be charged RM238 for the device. As we mentioned earlier, all three telcos is only offering the Mi 3 with a two-year contract – and that’s a really long period to be tied to any telco given the price of the Mi 3. It is arguably more worth it to endure the frustration of missing out a few times on the Xiaomi flash sales before landing one, than to be tied to a contract this long.